Gone are the days of lugging around a large projector for simple business meetings or home movie viewing. 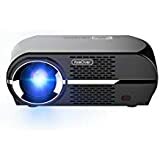 This list of the Best 5 Portable Projectors of 2018 offers consumers a concise list of projectors that offer budget-friendly features without compromising image quality or convenience. 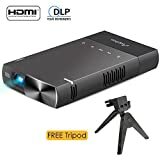 Whether you are looking for a projector that simply plugs into your iPhone or you want a device that can hold up to large backyard parties this list has got you covered with projectors that won’t break the bank. Many of these devices need less than a couple of meters to offer a large screen size for optimum movie viewing or professional work presentations. 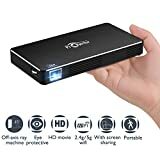 Perfect for home viewing in a small space, this projector operates with just over two meters of projection space offering a projection screen size up to 100 inches. A simple USB charge port makes this projector easy to use. 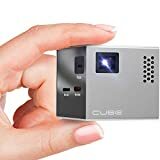 Whether you are looking for a small size projector for work or home use this device by VIVABRIGHT is worth considering. With an extra bright projection, this device is suitable for movies, photos, document presentations, and more. Long lamp life ensures users will get years of enjoyment out of this portable projector. Optimum projection distance is 2.5-3.5 meters.